Enjoy personal space for those important conversations. Ships flat. Build within 60 minutes with just a few tools. 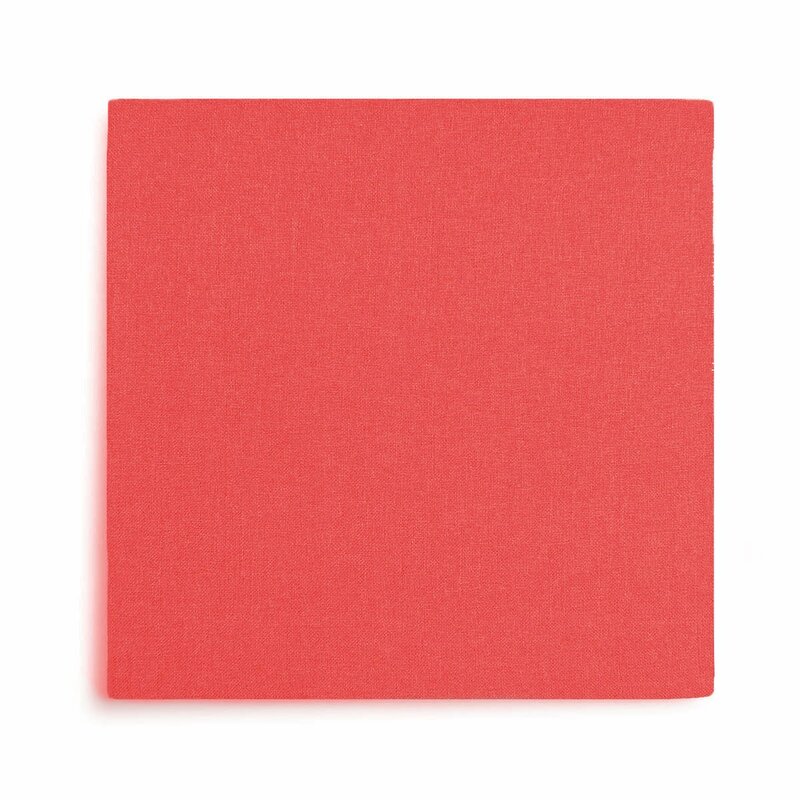 Sound absorbing materials for an acoustically sound experience. 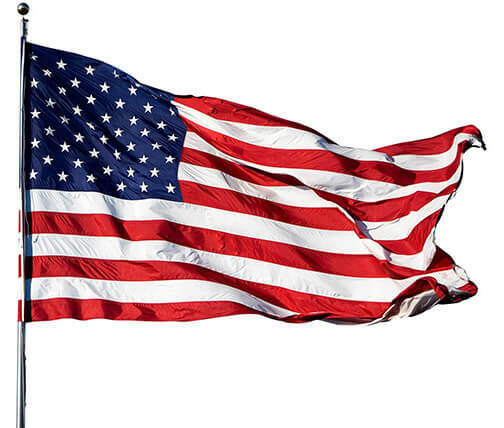 Designed, engineered & manufactured in Los Angeles. 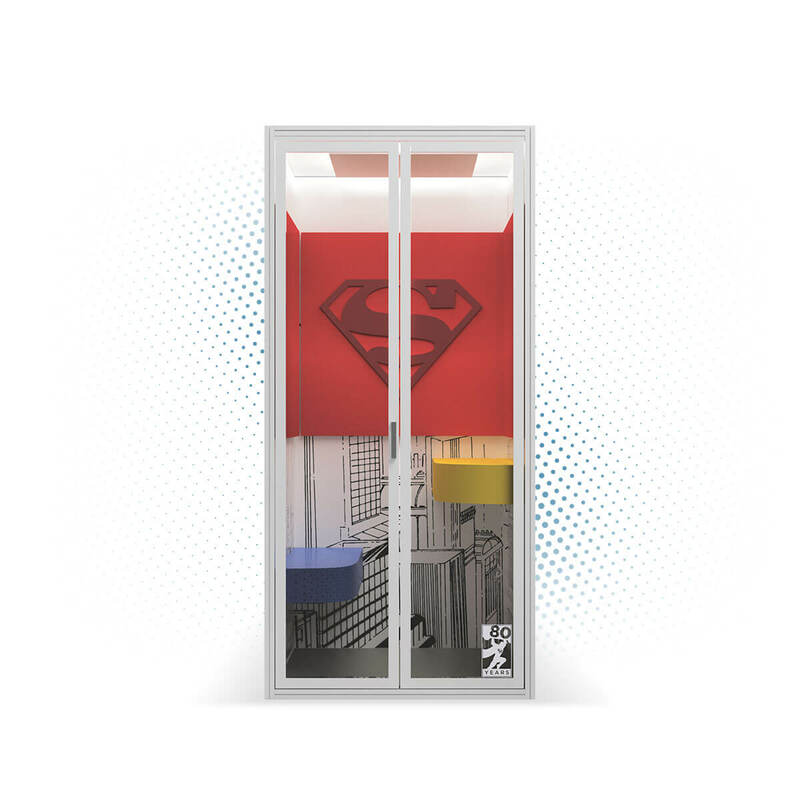 For the first time ever, the Superman phone booth is available for pre-order - the perfect addition to any office looking to fight the never-ending battle for privacy, productivity, and justice. 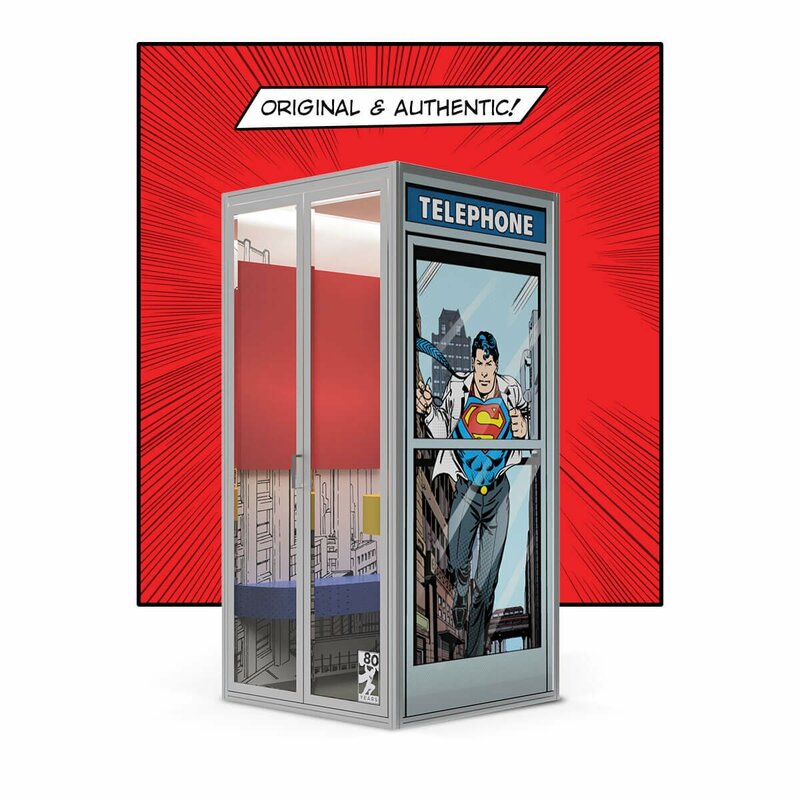 The officially licensed Superman phone booth comes with all of the benefits of Cubicall modern phone booths and now features the most iconic office Super Hero of all time. 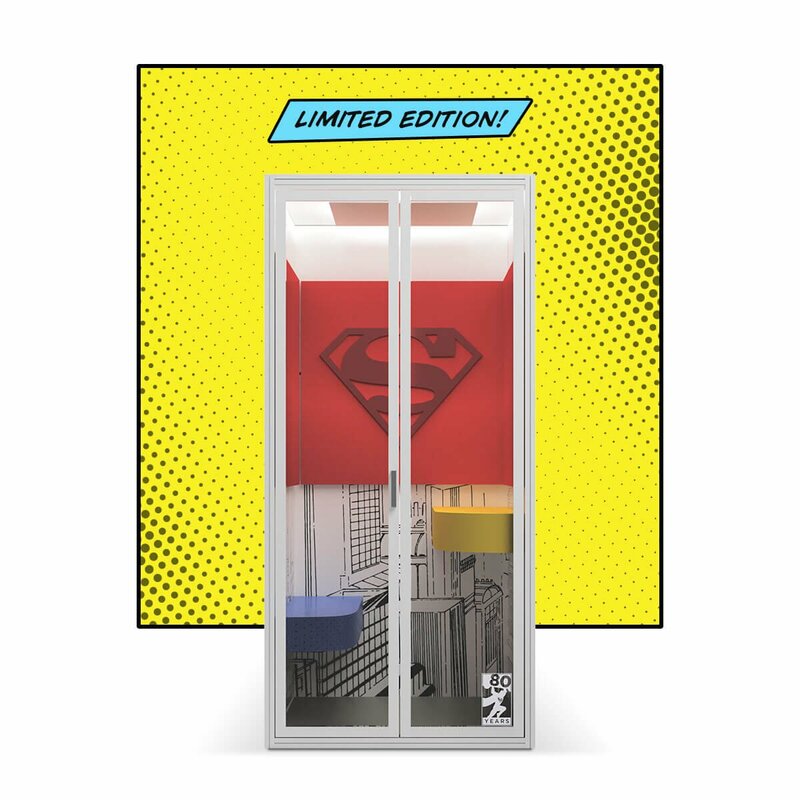 The first 80 orders will receive the limited edition Superman 80th Anniversary Edition phone booth. Superman Cubicall Phone Booths feature genuine, classic DC Comics Superman artwork on the exterior and interior of the phone booth. 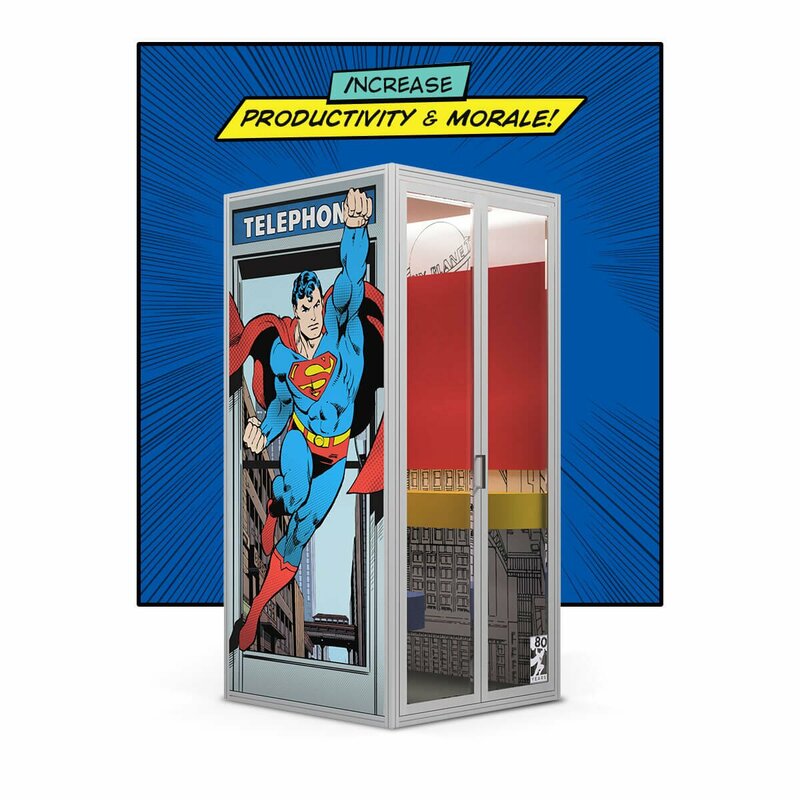 Cubicall modern phone booths are the efficient solution for the shortcomings of open offices - even the Daily Planet. Equipped with all the tools for modern communications, our phone booths bring back privacy, focus and productivity while increasing employee morale. Celebrate 80 years of the iconic office superhero. 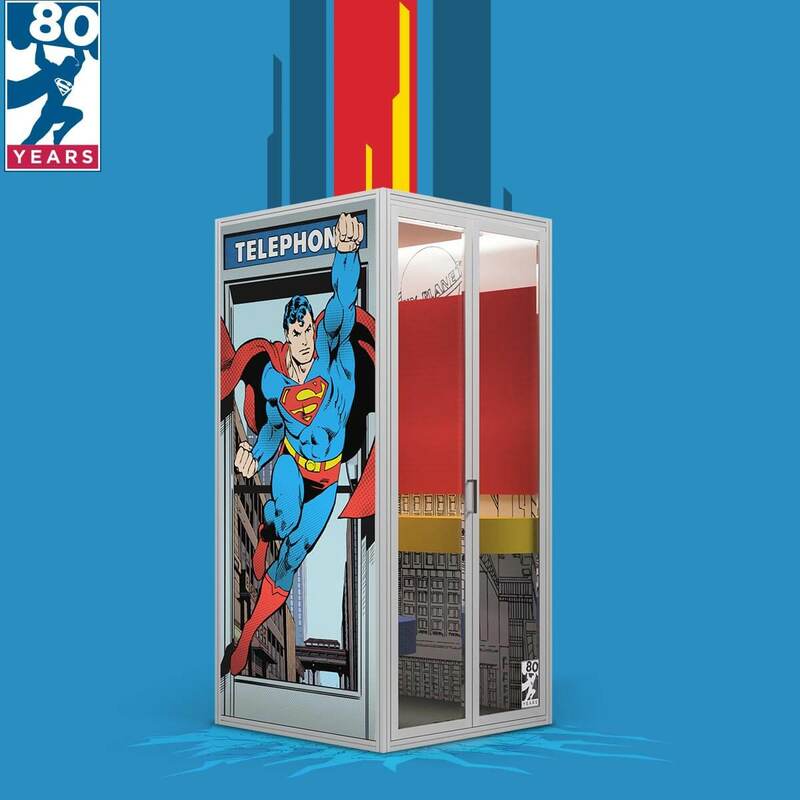 The first 80 orders will ship limited edition Superman 80th Anniversary phone booth with commemorative plaque and logo. "...an efficient privacy solution to open-plan distractions." Our simple & modern meeting booths are the efficient solution for the shortcomings of open office space design. The modular design ships flat and is easily assembled within one hour. Our meeting pods utilize an innovative locking wall assembly that requires minimal tools and creates a robust structure. Moving offices? No problem. The locking system also allows the booth to be easily disassembled, moved, and reassembled. Even though Cubicall comfortably fits two persons inside, the footprint is less than 42” x 42” and stands under 8 feet high. Our bi-folding door helps Cubicall fit in smaller offices where every inch of space is critical. The doors utilize double pane glass that helps reduce noise bi-directionally. Cubicall was made to give its occupants privacy. Therefore, we designed the booth to give an acoustically sound experience. The walls are built with acoustic fill that absorbs a wide range of sound frequencies. The interior of the booth is finished with acoustic panels, which not only helps absorbs sound, but also delivers a modern, elegant look. The bi-folding doors utilize double pane glass that helps reduce noise bi-directionally. Cubicall is equipped with all the essentials for modern communications and workload. Two USB outlets, 120-volt outlet, and Ethernet cables are built directly into the desk. Through an automatic light switch, the low power, low heat LED lights turn-on when an occupant enters the meeting booth, and turn-off once they leave. A powerful, yet, quiet fan built into the ceiling moves 110 cubic feet of air per minute, providing air circulation for a pleasant experience. Cubicall meeting booths are designed, engineered and manufactured in Los Angeles, California.